Southern Naturals body butters are made with pure natural and organic butters and oils. This body butter was formulated to help hold hydration in longer, even for the driest of skin. We pay plenty of attention to the skin on our face, but often forget about the rest of our body. This intensely hydrating butter is exactly what your body needs. 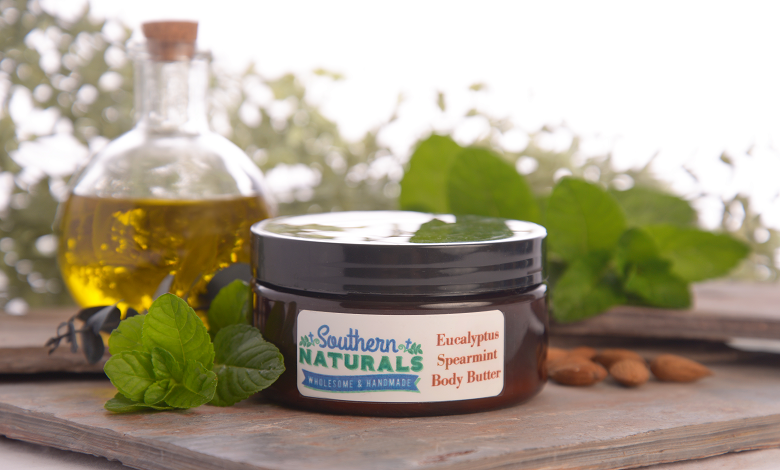 Southern Naturals formula is loaded with naturally nourishing ingredients like shea butter, jojoba, and coconut oil, and sinks in quickly to rehydrate skin. The lightweight whipped formula absorbs almost immediately, leaving skin velvety soft. Just smooth a generous amount into the skin all over your body, concentrating on rough places like your elbows and knees. Body butter is best applied after a warm shower. ~If you experience an adverse reaction to any product, discontinue use immediately. To perform an allergy test before using a new bath or body product, apply a small amount to the inside upper arm, leave on for one to two minutes and then rinse off. If you see an unfavorable reaction within 24 hours, discontinue use. ~Keep products stored up and away from children. ~Statements on this website have not been evaluated by the FDA and should not be construed as medical advice. ~Information on this site is not intended to diagnose, treat or cure an illness. ~By purchasing or using ANY items from Southern Naturals, it is implied that you have read and understand the risks of using herbs and herbal products and therefore release Southern Naturals from any and all liability. ~If you are pregnant, nursing or plan to apply to children, you must do your own research or contact your physician before using herbal products.